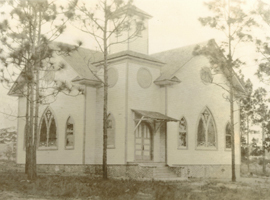 First Methodist Church of Geneva, Florida was organized as "The Lake Harney Society of the Methodist Episcopal Church South" on November 17, 1877. The first minister was Rev. Selwin D. Smith. The first meeting was held in a log schoolhouse which stood west of the cemetery. Later services were held in the homes of the members. It is recalled that regular prayer meetings were held at the home of Mr. and Mrs. S. D. Willams. On June 13, 1880 Andrew J. "Uncle Jack" Holder deeded a building site on the Northeast shore of Lake Geneva to three trustees. A church was erected there and was used until 1912. Services were held once a month by the Methodists and once a month by the Baptists, using the same building. From early in its history the church had an active women's ministry as seen in records of the Women's Home Society, Women's Missionary Society, and the Ladies Aid. By 1940 all Methodist Women's organizations were reorganized under the name of Women's Society of Christian Service. A Sunday School was in place by December of 1885. S. J. Lotson organized the first one as "The Sunday School of the Lake Harney Society." By 1905, the Epworth League was well organized. Four young men in the early years left the church to enter into ministry of various forms. The freezes of 1894-95 caused such an exodus from Geneva, that the church had great difficulty to survive, as it did also during and after World War I, when many moved away. The depression of the 1930's caused the few remaining members to sell the lots in the N.E. Corner of the church property to Mrs. J. C. Bills in order to reroof the church. No home was built on the area sold, so when Alice Bryan Coffee Guyton, daughter of the donor of the land heard of the sale, she bought the land from Mrs. Bills and re-deeded them to the church with a reversion clause in the deed: "If the land is not used for church purposes it returns to the Guyton family." As the community grew the church was no longer centrally located, so on June 5, 1909, Mr. H. B. Coffee in a trade with J.P. Musselwhite and Wm. H. Howard, gave a tract of land for a new church and grounds. Quarterly Conference records for September 9, 1911 authorized the selling of the first church and the building of a new one at the present location on First Street. First services were held in 1912, and the finishing work was done and debts paid with the new building dedicated in November 1913. For many years Geneva was a point on a circuit of the Florida Conference belt in several different districts, Jacksonville being the first, followed by DeLand, and now East-Central. The first circuit included Oviedo, Chuluota, Osteen, and Geneva. Some years later, Geneva, Oviedo and Ebenezer were a charge. Geneva and Mims were together from 1927 to 1940. A Fellowship Hall was erected West of the church in 1959 which has proved useful in many ways including use by Sunday School classes. At the present time it serves as the primary location for the Food Pantry. Sunday School classrooms were added to the North side of the Fellowship Hall in 1967. In 1973 the church broke ground and built the parsonage. Unsworth Builders of Sanford was the builder. There were so many donations for the building and furnishings that the debt was paid off in full -- A big feather in the cap of such a small church. In 1976, the church again took on a building project. This church had not been in debt and the only way we could have the "Youth Hall" was to secure a loan from a bank -- so this was done and the building began. The interior was completed in time for its consecration during the Centennial Celebration, on October 23, 1977. The celebration was held a few weeks early to accommodate the schedule of Bishop Joel McDavid who joined us for the celebration. This was the first time a Bishop had visited the church. During the celebration Bessie Proctor Herman returned to its home one of the first known gifts to the church, the silver communion cup, presented by Ida Leonard Raulerson. 1979 found the church anticipating a budget that would support a full-time pastor. At the 1980 annual charge conference our goal was to help our brothers and sisters in the Oak Grove Church rebuild after being destroyed by an arson fire. Click here for a list of Ministers who have served the church.